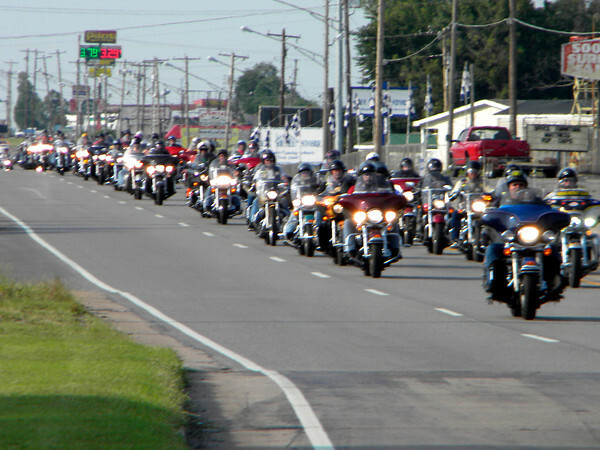 Legacy Run motorcycle riders head down U.S. 69 before spending Monday night in Muskogee on a 1,500-mile ride to the American Legion Convention in Houston. Hundreds of riders from across the Unit- ed States, plus Germany and Great Britain, are joining the run, which began Sunday in Indianapolis and ends Thursday. The run raises money and awareness for the American Legion’s Legacy Scholarship program, which helps children of veterans who have died while on active duty since Sept. 11, 2001. Robert F. Wicker, a former post commander for American Legion Riders Post 1340 in Oklahoma City, said rid- ers hope to raise $450,000 this year. This is the first year the run has visited Muskogee, said Jim Roberts, post commander for Muskogee American Legion Post 15. Donations for the Legacy Scholar- ship Fund may be submitted to American Legion Post 15, P.O. Box 705, Muskogee OK 74402. Informa- tion: (918) 687-6171.